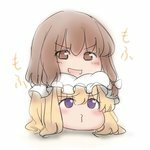 A bizarre 2ch meme usually showing characters from the Touhou series as disembodied, deformed heads with strange facial expressions, sometimes exclaiming "ゆっくりしていってね!!!" ("Yukkuri shiteitte ne!!!" - which roughly translates as "Take it easy!!!"). Based from a 2ch user's failed attempt to draw Touhou protagonists Hakurei Reimu and Kirisame Marisa using Shift_JIS / Ascii Art. Yukkuri also have prehensile hair. The following tags are aliased to this tag: yukkuri, take_it_easy (learn more).